You can now embed individual tracks from your SourceAudio site on your other sites, blogs, or anywhere that allows embedded content. The embedded player is a great way to promote your music on other sites & blogs while giving users an easy way to click through to your site to discover more music and contact you about licensing. Embedding tracks is currently limited only to admins. Setting up your players and embedding them is simple. Go to the track detail page for the track you want to embed in your site or blog by clicking on the track's title. Below the "License Now" button on the right side of the page you'll see a new "Embed" button - click it to display the player setup tool you see in the screenshot above. 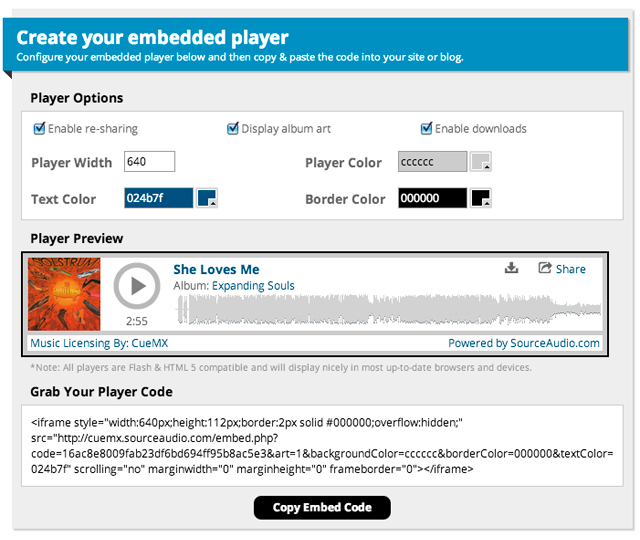 Configure your player by choosing your sharing & download settings for users who see this player embedded on your site or blog; define you player width; select your text, background, and border colors; and click "Copy Embed Code" to finish. Paste your embed code into your site or blog, save, and finish. Quick tip: Depending on your blog/page editor, you'll usually need to be in HTML or "source" mode for the player to appear properly. The new SourceAudio embedded player will play in all browsers and is fully HTML 5 compatible so it works well on iOS devices as well. What can you expect to see next with these players? We're going to extend the ability to embed tracks to all users who have access to your site - not just admins - and you'll be able to make catalogs, labels and albums embeddable/not embeddable through your music access profiles. Embeddable playlists are coming next. Enjoy your new embedded players!